One of the fondest memories I have of summers spent with my grandparents was big weekend breakfasts complete with everything you might imagine to be on a southern table. Thick slices of country ham and bacon, mounds of scrambled eggs, sliced tomatoes fresh from the garden, and homemade strawberry preserves. I am lucky that I spent the time learning how to make preserves from my granny while she was still alive; it a useful skill wrapped up in a heartwarming memory that I will never let go of. Rule #1 of homemade preserves: Always work in small batches of no more than 6-8 cups at a time. Making batches that are too large can result in preserves that don’t set properly. 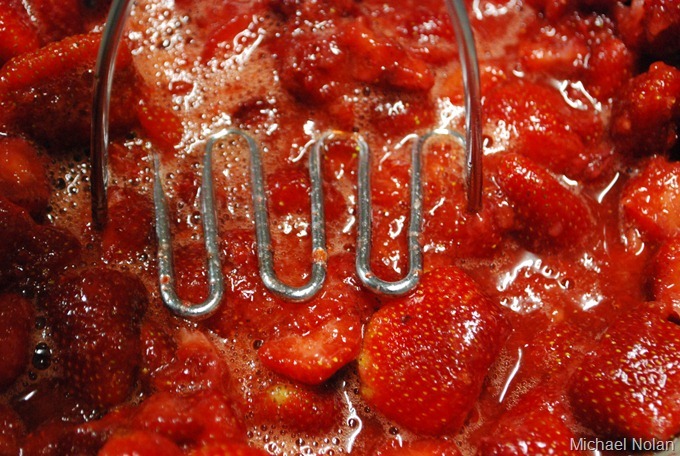 Clean, core and mash the strawberries with a masher. You can also puree some of them in a blender or food processor. I have found that this adds depth and consistency to the finished product. My granny taught me the old school ratio of 1:1 (1 part fruit to 1 part sugar), but sweetness is a very subjective thing, not to mention that each batch of fruit will have a different level of natural sweetness. 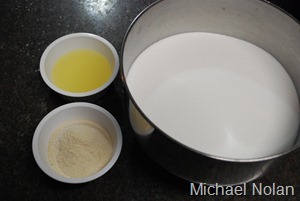 It is best to count on a 1:1 ratio but add sugar gradually until you have reached the desired sweetness. In my experience, I generally weigh the berries and use half that amount in sugar. 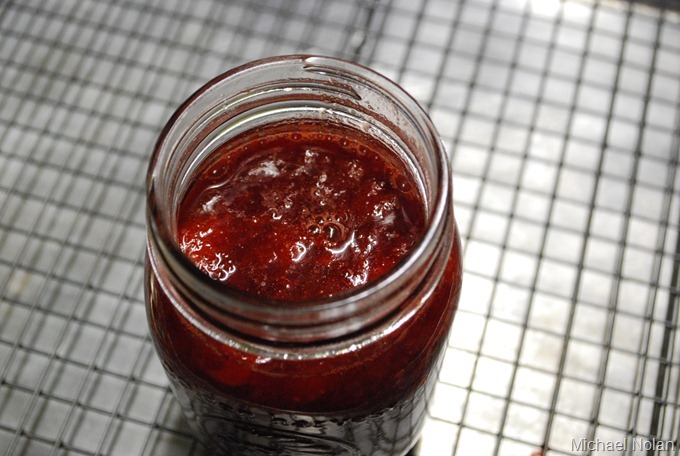 To muddy the waters a bit, it isn’t always necessary to add pectin but if you are inexperienced in making preserves it is certainly recommended. It is best to follow the package instructions on the pectin based on the amount of preserves you are making. Lemon juice adds acid to the fruit. Use about 1/4 cup per batch. 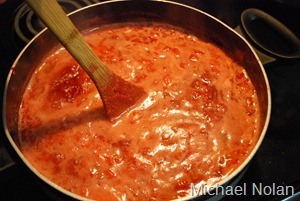 It isn’t necessary to add additional liquid when working with strawberries. They will release enough liquid to complete the cooking process on their own. Add the berries, lemon juice and pectin to a large stock pot and bring to a boil that cannot be stirred down. Immediately stir in the sugar until completely incorporated and return to a rolling boil, allowing the pot to boil hard for 1 minute. Turn off the heat and skim any foam from the surface. At this point your preserves are ready for canning, but if you’d like to test your batch for “set” (finished thickness), have a teaspoon in a glass of ice water on standby. Dip half a spoonful and allow it to come to room temperature. Tip the spoon to the side and see if you are happy with the consistency. If not, add more pectin and bring to the boil again for 1 minute. Once you are happy with the consistency, ladle preserves into sterilized jars and can using a water bath method. If you’re unfamiliar with basic home canning, stay tuned; I will share tips in the coming weeks as we learn to preserve the harvest from our gardens!